The actress also brought with her a hard copy of her own book, “True Beauty”, to give to the young cancer patient as a gift. 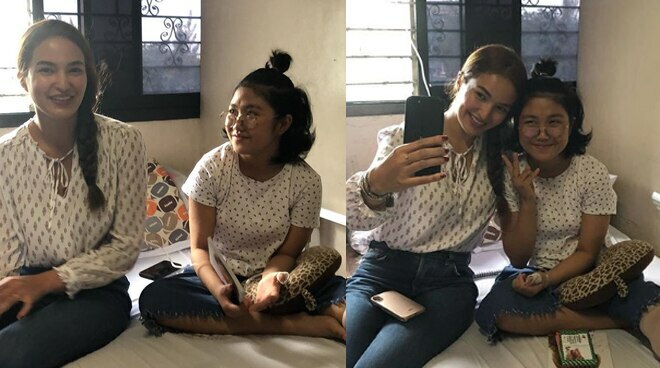 Sarah Lahbati just fulfilled a Christmas wish from a sick fan after making a surprise visit at the hospital where the latter is currently admitted in. It was the actress’ mother, Esther Lahbati, who accompanied Sarah at AFP Health Service Command yesterday, December 5, to witness and document the beautiful encounter. According to her, it has been a longtime wish of the fan, a young patient who has been battling bone cancer for two years now, to meet her favorite star in person one day. Today we surprised a strong, beautiful cancer patient Who’s been diagnosed two years ago with bone cancer, elaiza...matagal na niyang wish makita si Sarah. Christmas wish daw niya ito sabi ng mama niya... stay strong and always pray to God. He will never forsake us. sarah wrote psalm 42 in her notebook... “why, my soul, are you downcast? Why so disturbed within me? put your hope in God, for I will get praise him, my saviour and my God.” no matter how hard are our problems, we need to remember that God will never let us down. God bless you, Elaiza. and to all the other kids spending the holidays in the hospital.